City committee allows Hayes school to be the first sold under controversial 2015 state law. Hayes School. Image from Bing Maps. The former Hayes School will see new life as a charter school. Carmen Schools of Science and Technology intends to buy the Milwaukee Public Schools building and convert it into a home for the Stellar Collegiate Academy elementary school. The Common Council’s Zoning, Neighborhoods & Development Committee endorsed the proposed sale on a 4-0-1 vote. Area alderman Jose G. Perez made the motion, while Alderwoman Milele A. Coggs abstained without explanation. Carmen’s purchase of Hayes, if approved, would be the first school sold to a voucher or charter school operator under the 2015 state surplus schools law. Hayes was listed as surplus by MPS in August 2017 and, in compliance with state law, was offered for sale only to other education operators for a two-year period. Carmen submitted a purchase offer on January 18th. They were the only operator to make an offer. Stellar currently has about 150 students in K4 through third grade, but the school plans to add fourth and fifth grade in the coming years. The move into the Hayes School will accommodate planned growth to 380 students according to a city report. “We are really excited about the opportunity to grow our school,” said Stellar campus leader Melissa McGonegle. According to a city land disposition report, Carmen will invest approximately $1 million in the property. The building, with 16 classrooms, was assessed at $670,000 by an independent firm. The city, which administers MPS’ properties, will sell the property for $350,000 to Carmen, reflecting the cost of deferred maintenance. “We are pretty excited about this because we are bringing Steller Collegiate into our network,” said Carmen board member Ivan Gamboa. The elementary school is currently located in the former St. Patrick’s parish school at 1115 S. 7th St. Hayes is located at 2431 S. 10th St., almost two miles south, in the Lincoln Village neighborhood. Stellar hopes to relocate the school to the Hayes building in September. Stellar is chartered by UW-Milwaukee. Carmen, which operates a network of schools, is chartered by Milwaukee Public Schools. Carmen took over the operation of Stellar, which was founded in 2016, earlier this year. In addition to Stellar, Carmen operates four schools serving approximately 1,700 students. The charter network operates three high schools, delineated as South, Southwest and Northwest (a combined middle and high school). A stand-alone middle school operates on the South Side. The building to be sold, built in 1906, has 43,396 square feet of space. It was renovated in 1964 and 1995. The building, designed by the firm of Uehling and Linde, was known as the Fourteenth District School No. 2. and Fifth Avenue School. The school is named after president Rutherford B. Hayes. MPS moved the school located there, now known as Hayes Bilingual School, to 971 W. Windlake Ave. in 2012. The school shares a building with Kosciuszko Montessori School. Carmen currently shares space with MPS for two of its schools. Carmen South is located within the former Walker Middle School, alongside ALBA School. Carmen Southeast is located within Pulaski High School. Final approval on the sale is needed from the Milwaukee Common Council. Proceeds from the sale, minus selling expenses, will be given to MPS. While no one on the council has publicly objected to Carmen or Stellar, there are council members unhappy with the 2015 state law that requires vacant schools be only made available to choice or charter schools for two years. Once the state “takes its boot off Milwaukee’s neck” the city and private developers can get to work improving Milwaukee neighborhoods, Ald. Nik Kovac has complained in the past. 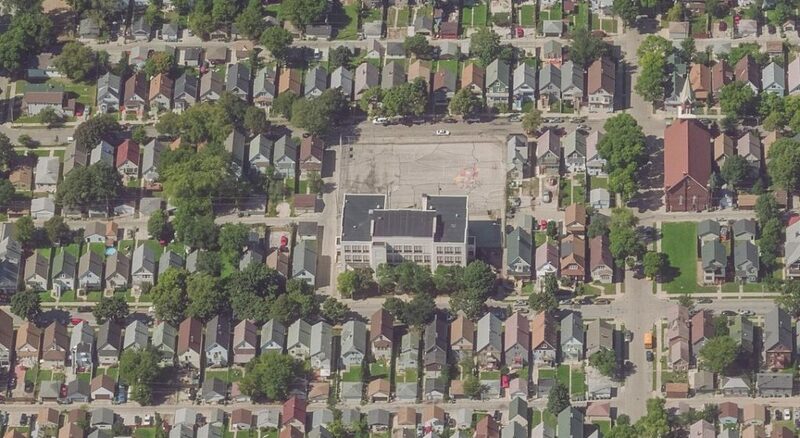 He slammed the state law at a 2017 hearing on the sale of the long-vacant Grand Avenue School. “We are on the ground trying to make good decisions for neighborhoods and people are trying to advance their ideology,” he charged. The city approved the sale of surplus schools to a handful of charter operators prior to the moratorium. Those schools include Samuel Morse Middle School, Lloyd Street School and 38th Street School. The council also approved the sale of Carleton Elementary School in 2016 to the national Rocketship school network, but the non-profit has not closed on the purchase of the building according to city records. It opened Rocketship Transformation Prep within a couple miles of the Carleton building. But many surplus school buildings have found new life as housing or other uses by private developers, which generates property taxes for the city. The former Grand Avenue School is slated to become a hotel. The former Garfield Avenue School was recently converted to apartments. Gorman and Co. redeveloped the former Fifth Street School into apartments and is now working on the former William McKinley School. The former 37th Street School is slated to become apartments. Royal Capital Group is seeking to redevelop the former Phillis Wheatley School as apartments. Cream City Hostel is being built in a former MPS building after a zoning change for a choice school operator was rejected. Republicans state that they believe in local control. However, they are always ready to undermine local control if it is to benefit one of their special interest groups.